The penultimate episode of The Walking Dead: The Final Season dropped yesterday, and it would seem that we won’t be waiting too long for the conclusion to Clementine’s post-apocalyptic adventure. The zombie game’s finale is due to arrive on March 26. That information comes from the Main Menu screen (via DualShockers), which was updated yesterday with the release of episode three, titled Broken Toys. That menu screen showed that episode four was still locked off, but its name – Take Us Back – and a March 26 release date were both prominently displayed. If accurate, that means we’re only a couple of months away from the final episode of The Walking Dead. Given the game’s tumultuous development, the fact that we’re seeing these last two episodes come out is notable in and of itself. 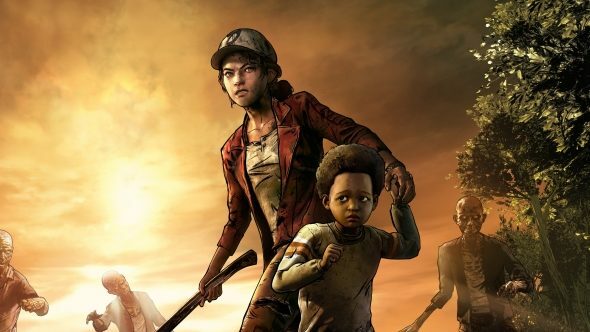 The game’s original studio, Telltale Games, closed down mid-development last year, and for a while it looked like The Final Season would never be completed. Since then, development has been picked up by Skybound Games, and the game is now on sale on PC via the Epic Games store. There’s no information about the final episode’s story just yet, but I imagine we’ll learn more closer to its release date. Hopefully, Clementine and co get to wrap things up with a happy ending, but I doubt it’ll be that easy.